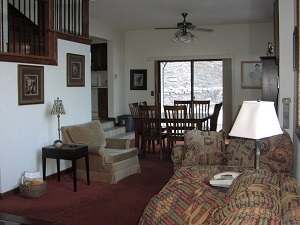 Jack and Linda have been professionals in the vacation rental business for more than 20 years. The Murrays have spent the past several years in Durango, Colo., where guests are treated to clean vacation rental, complete with features expected at home. We pride ourselves in offering a clean, well-appointed unit with all the extras of home. There is no question that our guests appreciate the extras we provide by how they treat the vacation unit like their home. Our townhome is furnished with all the conveniences that will make your stay comfortable, such as a fully furnished kitchen with everything one could need. We even provide coolers for picnics. 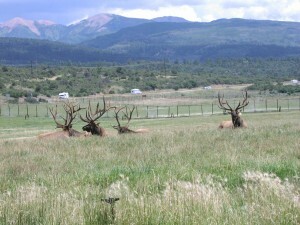 The townhome is located in a quiet area in a small complex, where you get great mountain views in all directions. The Durango & Silverton Narrow Gauge Railway passes above us, giving great opportunities for great pictures. Our vacation rental is located in a prime spot for you to enjoy the endless outdoor activities that the Durango area has to offer. Just settle in and enjoy Durango or make day trips to Mesa Verde, Silverton, Ouray, or even south to the desert areas, all of which are just a drive of an hour or two. Durango Mountain Resort is just 15 minutes from your door. As locals, we enjoy helping you plan your vacation activities. We’ll help you come up with a great day that takes into account the interests, ages and abilities of your group. 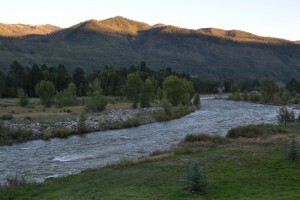 We live on the Animas River, and each morning we wake up and say, “Another day in paradise,” and it’s so true. Our renters are welcome to just sit and fish from our deck ─ to enjoy the river with us. Indeed, we do live in paradise. We are so lucky to live in a friendly town for everyone to enjoy, with beautiful scenery, great restaurants, limitless hiking and biking, and a fantastic recreation center. Be sure to click on the links in our personal list of Durango Activities, which is loaded with things to do in and around Durango. Our renters find it very helpful and it includes lots of free things to do that are great family fun. So, what are you waiting for? Come share our little piece of paradise and experience a real cowboy experience on your vacation.